The apartment is quiet. The decor is modern which I like. We used the deck everyday. It's very spacious, well organized and comfortable. Very close to downtown and a few supermarkets. Recommended! 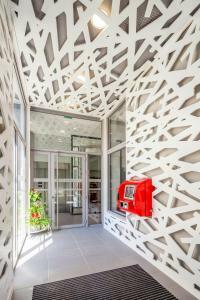 Fully automated apartment with self service. Rooms are neat and value for money. Very quiet area (except when France won their World Cup semi final ha ha). A short walk to the tram stop to get you into town and very reasonable at 1euro 60 c. We had a view of the mountains from our apartment which was lovely. Apartment very spacious and clean and very good value for money. Three supermarkets within a short walk which is always a bonus. We stayed there last summer and are disappointed by the experience, this time, compared to last summer which we enjoyed very much. Last summer the machines in the lobby provided coffee, tea and fruit juices, this year there was only a few tea bags and coffee (on two of our 3 days there was no coffee left). It felt like there was no one in the building you could ask anything and whilst the furniture is pleasant and modern, it is not practical. In 308, you cannot lean on the back of the sofa or you fall backwards (although it looks like a normal sofa) which happened to our daughter as she had a hot drink in her hand, this is not safe, this sofa should only be leant against a wall. There is no staff for welcoming and check-in. Everything e.g giving reservation code and getting access card was done automatically by the machine. It was interesting for me but maybe not for everyone. We enjoyed staying in a modern, clean and comfortable apartment. New, nice flat, at a convenient location and with parking. Spacious and comfortable apartment. It was a bit cold at arrival and it takes some time to heat up. place good. well located. nice design. modern. feeling like home. 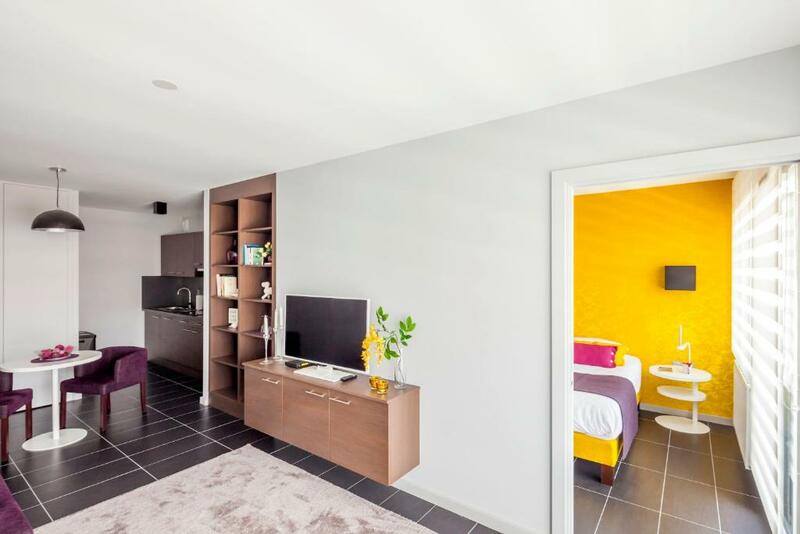 Lock in a great price for Tempologis Grenoble – rated 8.4 by recent guests! 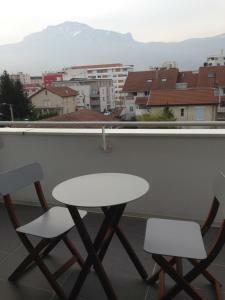 One of our top picks in Grenoble.Tempologis Grenoble is located in Grenoble and offers self-catering accommodations. Free WiFi access is available. The property is 0.6 mi from Paul Mistral Park and 1.6 mi from Grenoble Train Station. 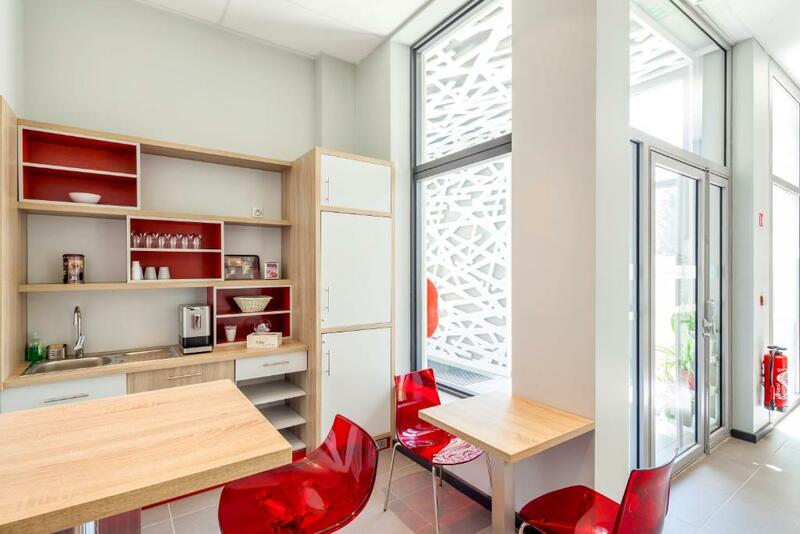 Apartments at Tempologis Grenoble feature a flat-screen TV, a balcony and a seating area. There is a full a kitchenette with a dishwasher and a microwave. Featuring a shower, private bathroom also comes with a hairdryer and free toiletries. You can enjoy mountain view and city view from the room. At Tempologis Grenoble you will find a garden. Other facilities like grocery deliveries, laundry facilities and a vending machine are offered. Grenoble-Isère Airport is 27 mi away. This property is also rated for the best value in Grenoble! Guests are getting more for their money when compared to other properties in this city. When would you like to stay at Tempologis Grenoble? 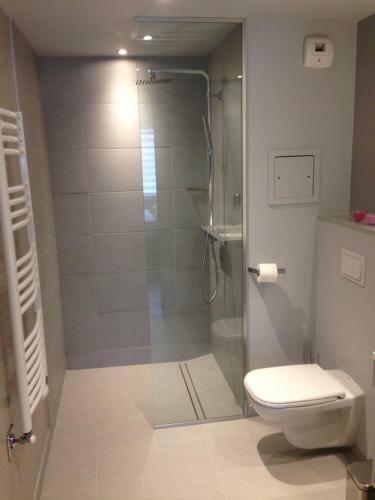 This apartment has a private bathroom with a walk-in shower. 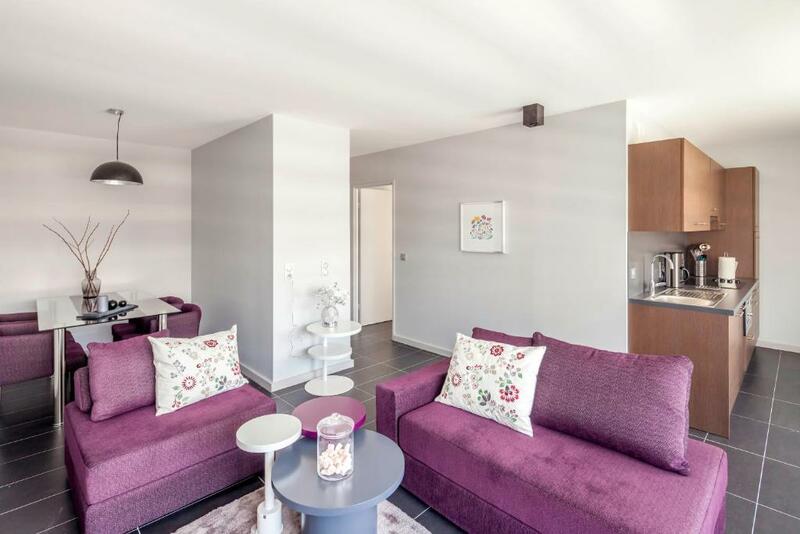 The double bedroom features a wardrobe and the apartment opens onto a furnished terrace. The kitchenette is equipped with a stovetop, coffee machine and dishwasher. Les appart'hôtel de la résidence le Saint Germain sont situés à proximité du centre ville, dans un environnement pavillonnaire calme, proche de la ligne du tram, des espaces culturels, touristiques et des centres d'affaires. 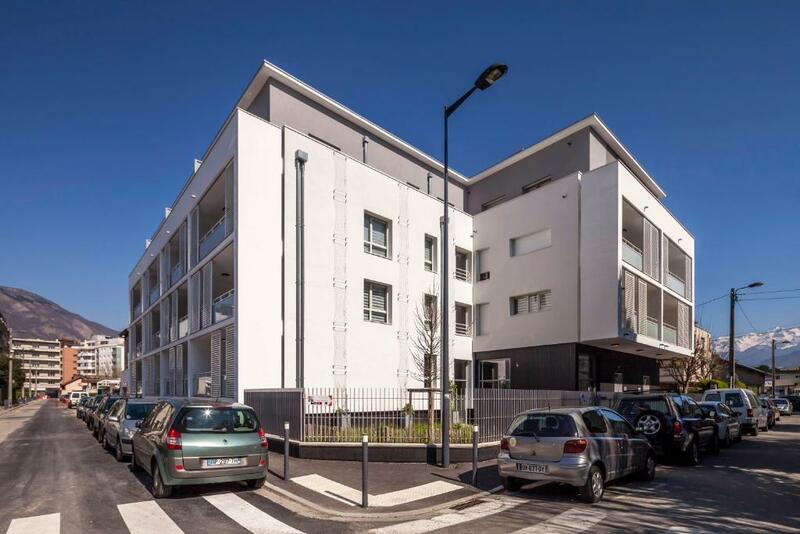 D'esprit contemporain, ils ont été pensés pour être en harmonie avec l'environnement : - eau chauffée grâce aux panneaux solaires - chaudière gaz à condensation délivrant un confort personnalisé, douillet et le moins énergivore possible - toiture végétalisé où les abeilles se délectent du pollen des végétaux aux espèces diversifiés garage à vélos pour accueillir aussi les vel'lib mis à disposition par la METRO - et prochainement un jardin pour plantes aromatiques. Le personnel est à votre écoute. Un simple appel téléphonique pour vous aider pendant votre séjour. Un gardien est présent dans la résidence de 20 heures à 7 heures le matin. Proche du centre ville et facile d'accès par les transports en commun (tram et bus). Au calme, dans un quartier pavillonnaire, la résidence le Saint Germain possède un garage en sous-sol sécurisé. Les commerces et restaurant sont à 10 mn, le parc Paul Mistral est à 15 mn à pieds. 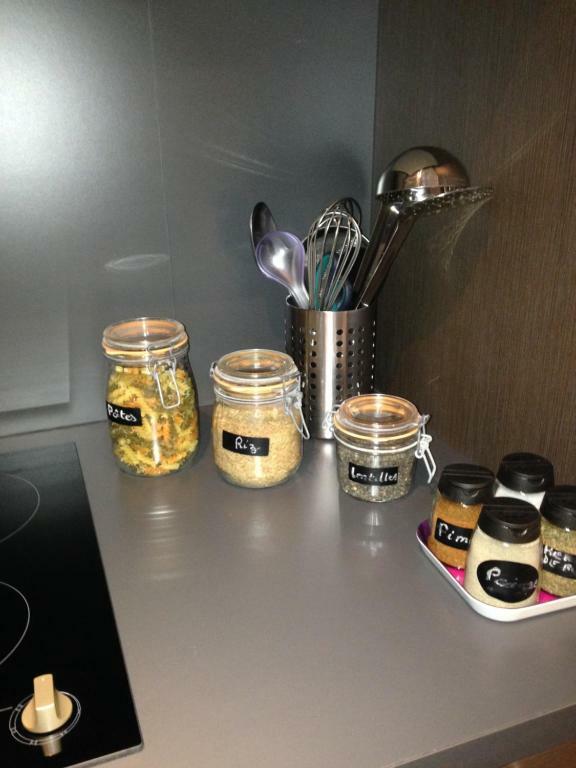 House Rules Tempologis Grenoble takes special requests – add in the next step! Tempologis Grenoble accepts these cards and reserves the right to temporarily hold an amount prior to arrival. Please note that after booking, guests will receive a confirmation from the property with access codes and instructions to obtain their room's card. Please note that there are video surveillance cameras in the property. No damage deposit is required, however, the property reserves the right to invoice guests of the damage estimated amount in the event of degradation. An inspection will be carried out before the arrival and after the departure of each customer. We couldn't operate room heating and tried to reach reception directly and over phone also, but failed to reach them. The entrance gate is also not opening properly. It gets struck some times. We struggled to enter initially. The weather was hot while I was there. A fan would have helped moved the air. My husband and I needed to buy many kitchen items: scub brush, kitchen towel, kitchen soap. Key code had changed prior to arrival and no sms received. Couldn't get anyone on phone so had to go through Booking.com. Took a long time to sort but got there in the end! Two other couples had the same issue. Apartment we had was very hot and you cannot have doors open at night due to mosquito's, so bear in mind if staying when it's hot. Mattress too soft for me and i hated the pillow, but that's just personal preference. No kettle. Wi-Fi free does not work, it is not possible to contact personal by phone, very loudly arabic music from the outside during night time. The instruction to get into the building was not sufficient. The passcode to garage was broken and the staffs didn't speak English so couldn't get the enough help to enter the building. We had to wait in front of the garage for half an hour waiting for the staff come to help us. From 2nd day of our stay there was a problem with the heating system and radiators. It was such a big deal in rainy cold weather during our stay, that we need to buy a small heater for warming the room. I guess it was only our apartment with this problem. Although I told them about it and they send someone to fix the issue, it was still there to the last day. There aren't closets in each room. HEATING> Cannot set Heating higher than 22C so i felt always cold!! KITCHEN> There was only 1 soap tablet for the dish washer for one whole week of my stay. (unaccepatble). Instead there was 2 additional tablets for laundry washer?? Am i supposed to wash dishes with clothes soap?? On top of that there was no soap neither sponge for hand wash of dishes and clean the kitchen. BATHROOM> Fancy look design but without shower door, when showering, the whole bathroom gets flooded (gross design mistake) and as there is no room service during the stay...the bathroom floor is always wet even when you get to hotel after work. BALCONY> Apartment is clean, however the balcony is not clean since months ago. Why? ?